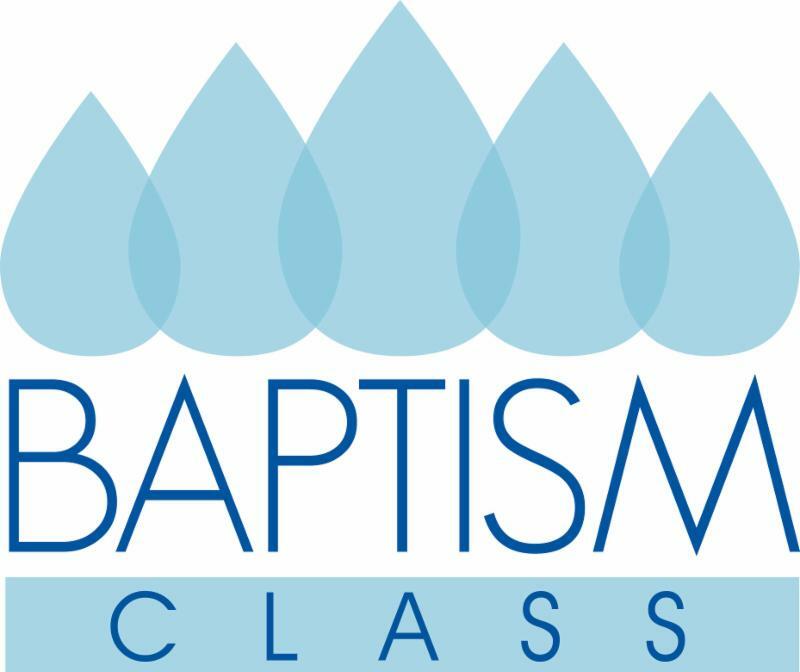 Baptism Preparation Class is required if this is your first child or have not had the class in the last 5 years. Our next scheduled class is: Monday, April 1 at 6:30 pm in St. Teresa’s Rectory Basement. Note - There are NO Baptisms during Lent. 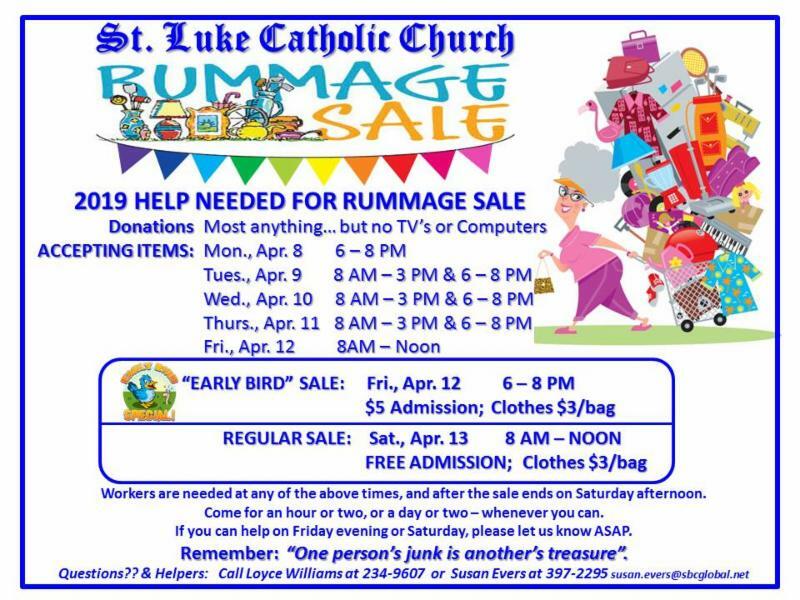 Contact Sr. Annette Kaba at 233-3500 for more information. 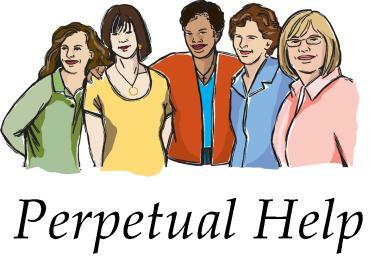 All women of the parish are invited to join us at our next meeting on Tuesday, April 2 at 6:30 pm in St. Teresa's Parish Center. Join us for food and friendship. Free child care available. 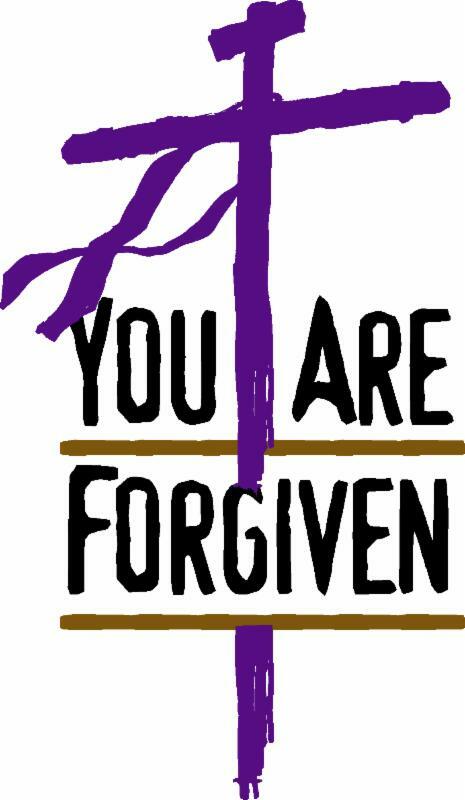 Our Cluster Lenten Reconciliation Service will be Wednesday, April 3 at 6:30 pm in St. Teresa Church. 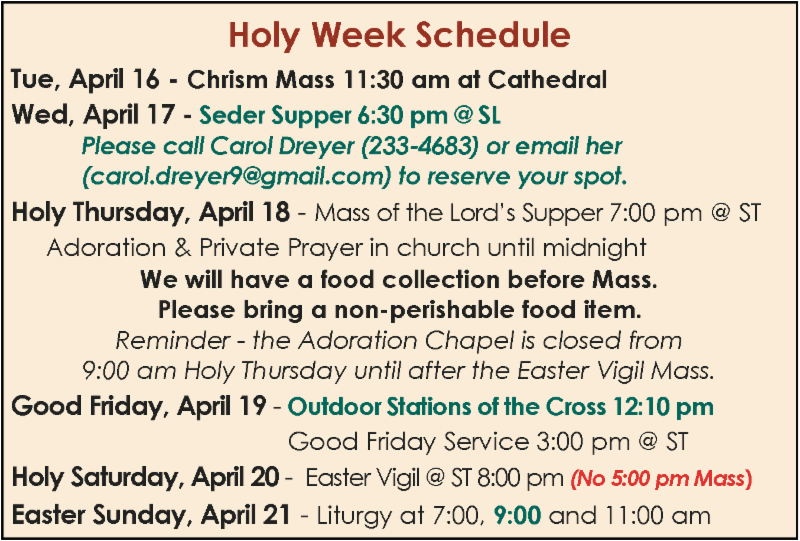 Offered Fridays at 2:15 pm in St. Teresa Church. Ecumenical Stations of the Cross are held on Fridays at 12:10 pm at St. George/St. Mark. 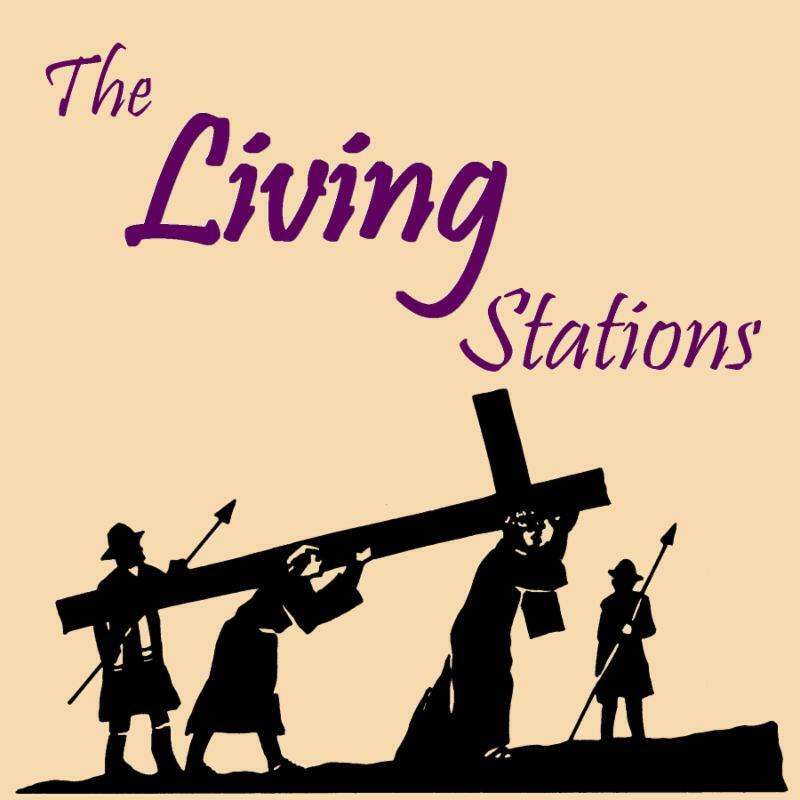 Our 8th Grade Students will present The Living Stations on Friday, April 5 at 10:15 am. 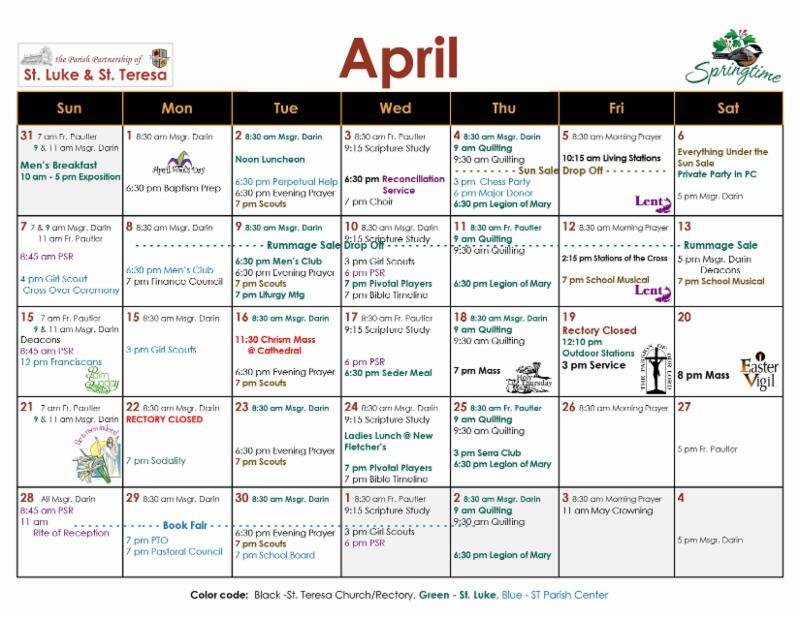 Joint Outdoor Stations will be Friday, April 19 at 12:10 pm beginning at St. Luke Church and ending at St. George/St. Mark. 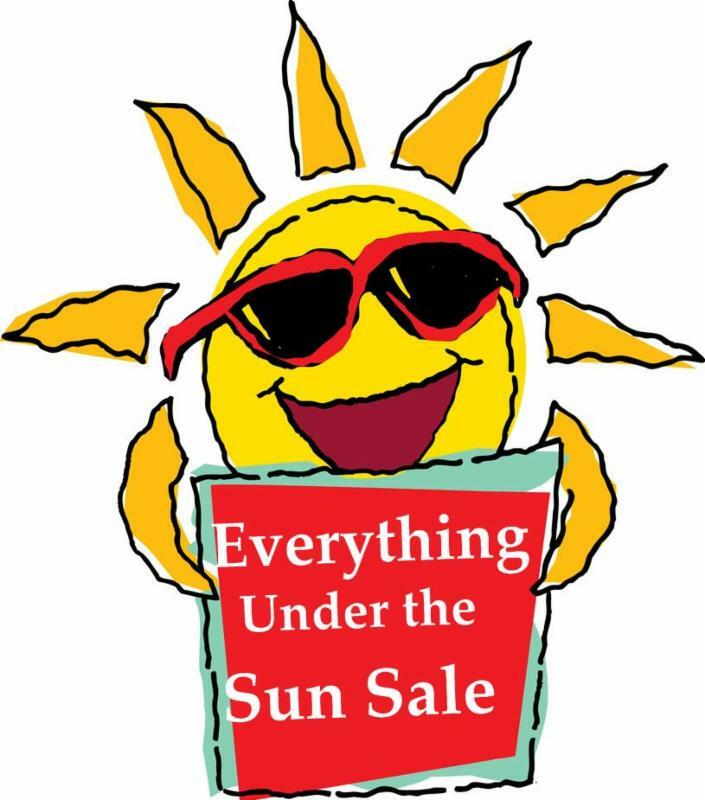 Everything Under the Sun Sale! and bring your discarded treasures to us. 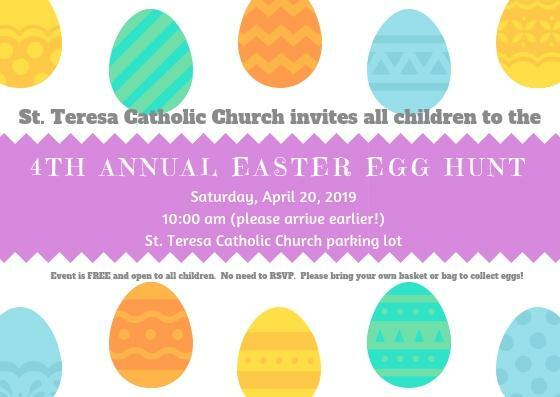 Drop-off will be in the School Gym. We can always use help with the sale. 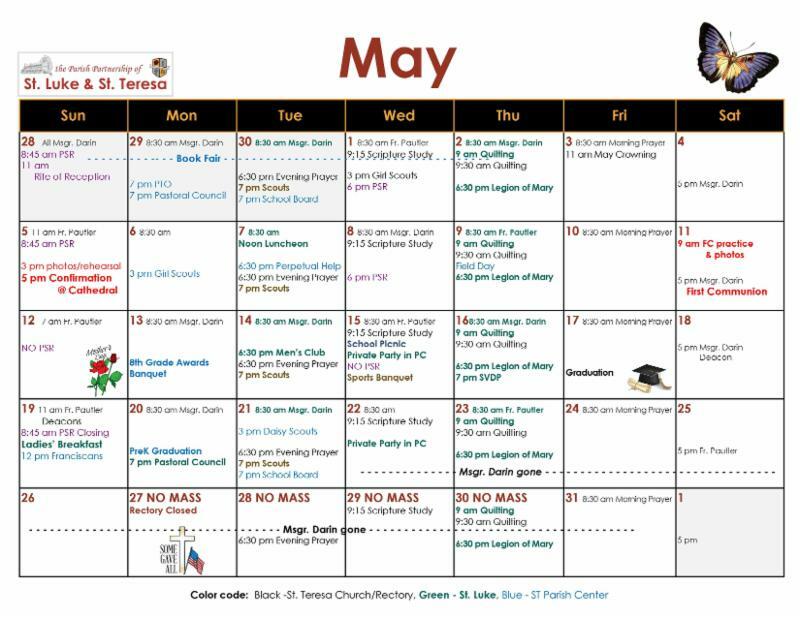 St. Teresa's Men's Club meeting is Monday, April 8 at 6:30 pm in the parish center. 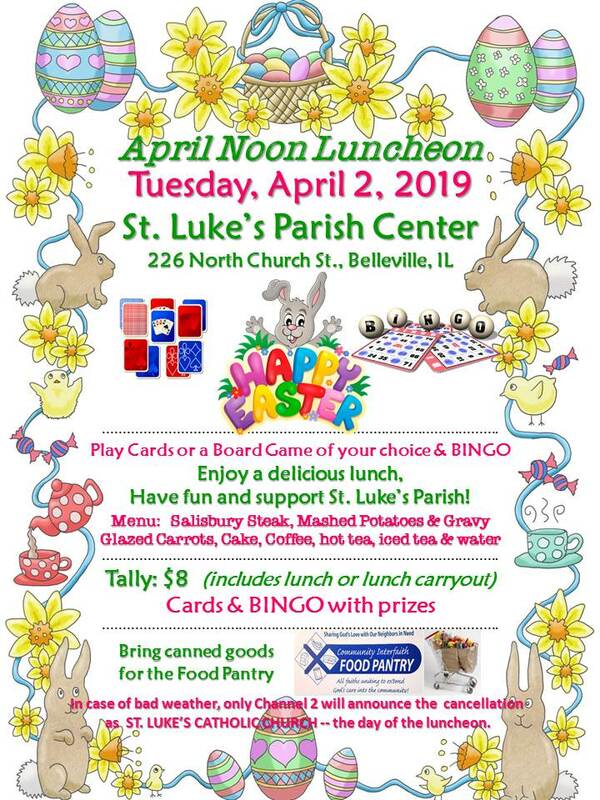 St. Luke's Men's Club meeting is Tuesday, April 9 at 6:30 pm in the hall. 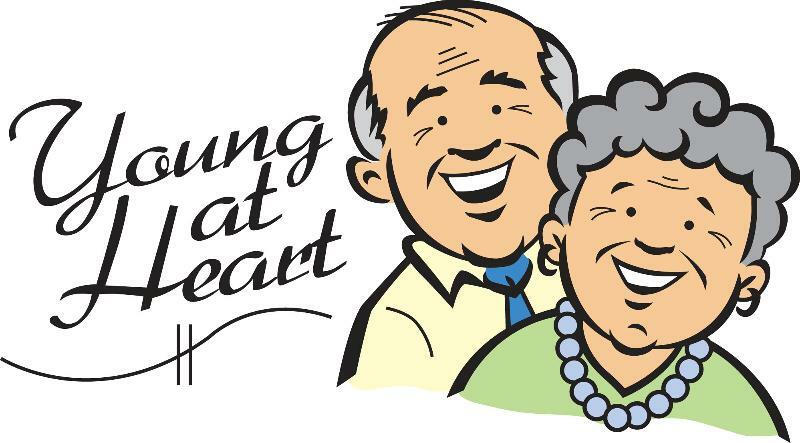 Young at Heart will Dining Out on Wednesday, April 10 at 12:30 pm at The Horseshoe in O'Fallon. Come join us for good food and fellowship. 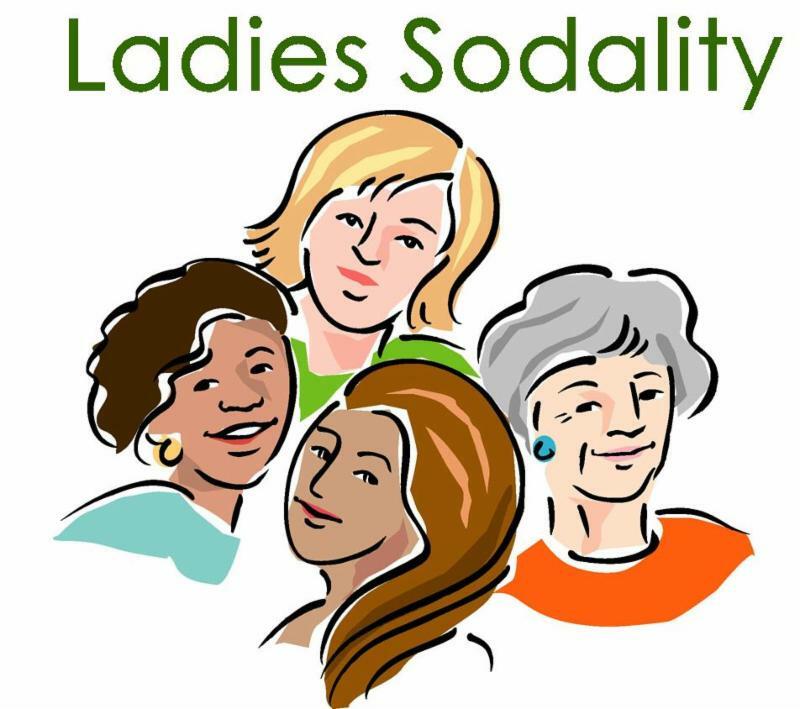 Ladies Sodality meeting will be on Monday, April 22 at 7:00 pm in the Community House. Ladies Lunch will be on Wednesday, April 24 at 12Noon at the new Fletcher's.